Arizona is home to some serious scenery: the Grand Canyon, Monument Valley, Antelope Canyon. While those are far from any major city, just an hour from Phoenix sits an untouched swath of pristine Sonoran Desert. 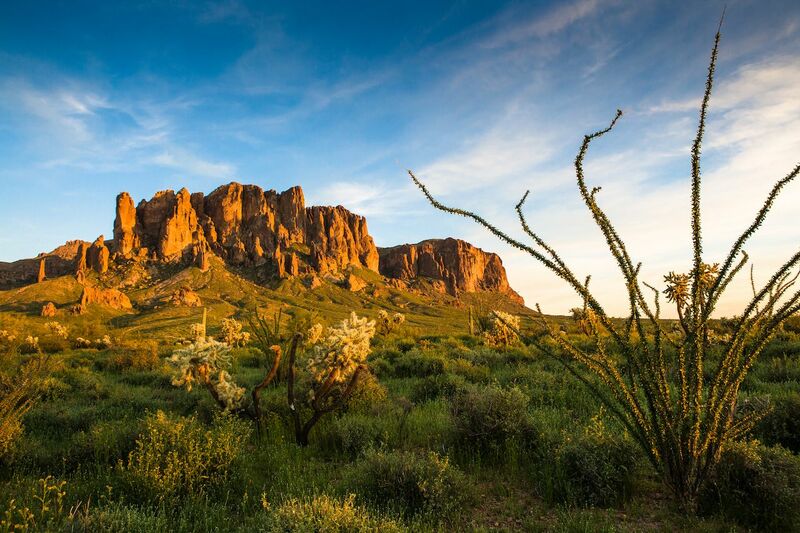 The Superstition Wilderness, with its eerie red spires and lanky saguaro cacti, offers equally stunning vistas, is full of wildlife, and has miles of trails to explore. Follow these tips on how to backpack this stretch of desert. Pristine Sonoran Desert habitat is getting harder to find in Phoenix. But within easy reach of the country’s sixth-largest city lie the Superstition Mountains. They’re populated by ring-tailed cats; coyotes; javelinas, which look like little wild boars; and even mountain lions. Originally designated as a federally protected wilderness in 1939, the area covers more than 160,000 acres. 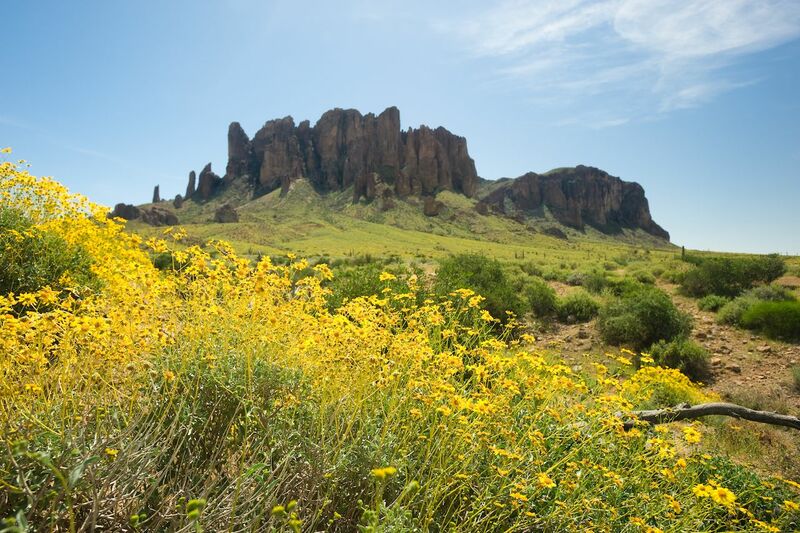 At its heart, the Superstition Wilderness holds the gutted core of an extinct volcano, which thrust dramatic rust-colored pinnacles into the sky. 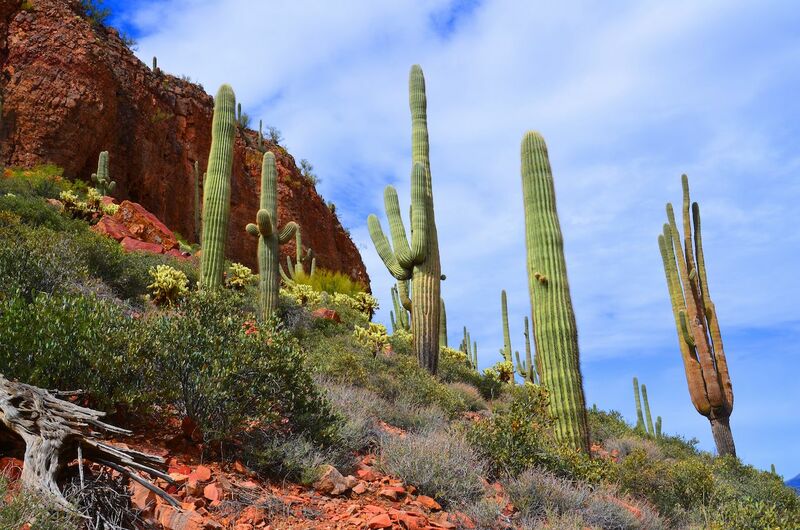 Canyons and mountain slopes are dotted with iconic saguaro cacti, some hundreds of years old. Several popular trails and routes run through the Superstitions, including the popular Peralta and First Water trails. These are the heavily populated due to their easy access. But venture beyond these two routes and you’ll likely encounter few other hikers, even just five miles from your car. In fact, there are around 180 miles of trails threading through the wilderness, so it’s easy to build your own route by knitting together multiple trails, several of which form multi-day loop routes. 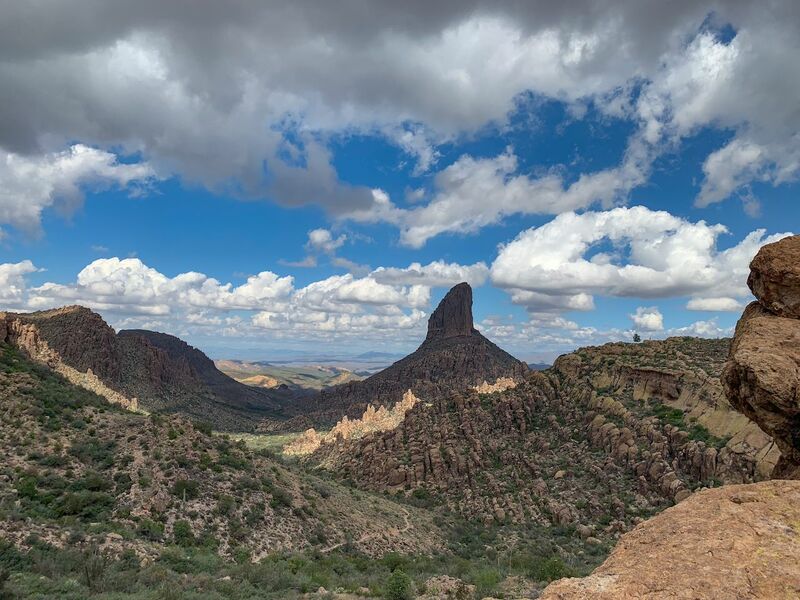 It’s hard to go wrong with just about any route here, but consider looping through Peralta Canyon where you can access a side trail that leads to the Fremont Saddle overlook of Weavers Needle, a popular rock climbing spot. Visitors are also drawn to Miner’s Needle, another striking rock formation. Red Tanks Canyon and the Whiskey Springs Trail both offer access to quiet stretches of backcountry with outstanding scenery and — an all-important element of desert backpacking — water access. Reavis Falls is a worthwhile spot, too. Here, a nearly 200-foot waterfall forms an improbable sight in the desert landscape. This being the desert, you’ll need to come prepared for extremes, especially when it comes to daytime heat and sun exposure. Don’t underestimate the cold, though, if you’re here in the winter. Freezing or close to freezing temperatures are common, as the mercury falls quickly once the sun goes down. In addition to your typical backpacking gear (tent, water filtration, cooking supplies, sleeping bag, etc. ), bring lots of sun protection, like sunscreen, a brimmed hat, and lightweight long-sleeve shirts and pants. Along with lots of water, consider packing a sodium replacement drink or dissolvable drink powder, which will help keep dehydration and hyponatremia at bay. Salty snacks, like potato chips, beef jerky, and pretzels can also help with this. Though located near a major urban area, the Superstitions are sneakily dangerous. This is a rugged wilderness where some 180 miles of trails range from very well-marked, well-trodden paths to remote trails that are easily confused with washes and game paths. Overnight visitors should equip themselves with a topographical map and navigation tools, and they shouldn’t plan to rely on cell phone coverage. They’re called the Superstitions for a reason: This wilderness has a Bermuda Triangle-like effect on hikers, and people routinely get lost here. Whether it’s some sort of supernatural force at work, the lure of rumored buried treasure, or just the nature of these mountains, it’s important to take adequate precautions. If you’re uncertain about your abilities, local guide service Arizona Outback Adventures leads guided Superstitions trips that are perfect for backpackers of various ages and experience levels. The Arizona desert can be an unforgiving place. Extreme heat and sun exposure are typical during the day, so this area is best avoided during the height of summer. Winter daytime temperatures can be comfortable, but nighttime conditions can quickly turn cold. Water is tough to come by in any season. Be sure to pack in at least three liters per person — more if you’re traveling on a hot day — and plan your route around reliable water sources. Fall and spring are also fantastic times to visit. The weather is mild, and the water sources are reliable. In spring, the desert comes alive with bright colors and flowers. 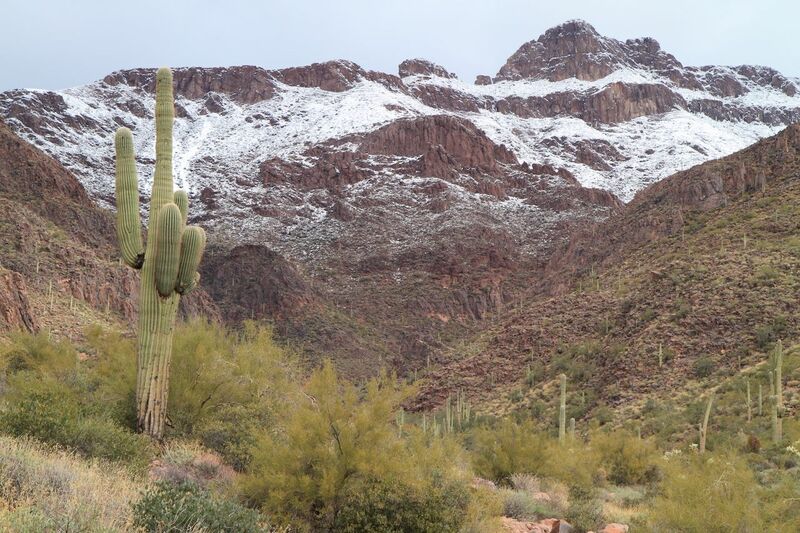 Overnight visitors to the Superstition Wilderness do not need to buy permits in advance. Group size is limited to 15 people and 15 head of livestock, and the Forest Service requires you not stay longer than 14 days. Otherwise, practice Leave No Trace principles: tread lightly, respect the landscape and other visitors, and pack out your trash.